Surtido de tres tomates "La Catedral"
Ven a disfrutar de un recorrido histórico y gastronómico en pleno centro de Madrid de mano del restaurante La Catedral. Sus distintos salones privados evocan diferentes épocas de la capital entregando así una estancia llena de nostalgia y encanto en donde la decoración barroca predomina en gran parte de sus espacios. Su menú diario se nutre de los mejores y más frescos productos del mercado que dan lugar a una amplia gama de platos que incluyen carnes y pescados, verduras y hortalizas de temporada. Deliciosas recetas como el solomillo y secreto de ibérico con mojo picón son sólo algunas de las mejores especialidades que podrás saborear en su mesa. 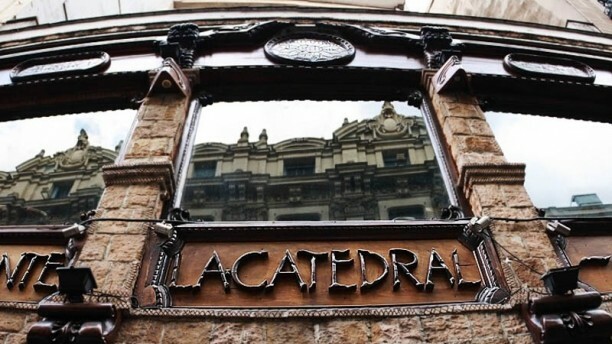 El restaurante La Catedral es mucho más que un simple espacio gastronómico ya que su puesta en escena da vida a los momentos más emblemáticos y representativos de la ciudad de Madrid. No te lo pierdas, una aventura memorable te espera a ti y tus amigos en sus hermosas instalaciones. Great starter and dessert but the main was not good - cold. Service was hit and miss. Would not return. Absolute disgrace in regards with food and service. The only positive in this place is overall look of the restaurant. I understand that Sunday evening everyone can be tired but first time in my life I left restaurant hungry. I don't know where this 4/5 came D15 ok m but honestly I'd give negative points if I could. Rice wasn't even cooked, was crunchy and absolutely no flavour. 8 pieces of seafood altogether and lots of canned red peppers plus green peas - if that would be my first paella I wouldn't dare to try it again ever. Vegetable lasagne uneatible, calamari the same, only thing that defended tonight was a wine. My bill was overcharged by over 50 euro "by mistake" and fixed after I questioned 3 positions on it. I DEFINITELY NOT RECOMMENDED TO GO NEAR THIS PLACE unless you want to take a look inside. Very nice restaurant, but a bit too busy. Environment, food quality, service are good. Great ambience and delicious food; very reasonably priced. We chose this restaurant because of its proximity to our accommodation but it was really delightful and far exceeded our expectations. Wonderful staff, but more importantly, delicious food and wine. And nothing fell short of the mark. Every dish was well prepared and seasoned. There is clearly some talent in the kitchen. Thanks for a delicious meal. Good food in an old establishment with many antique features, warm ambience and local flare. Beautiful setting! Food was good and staff very friendly and helpful. A lovely real Spanish experience! Saw the reviews and the website and seemed a good choice. Made reservations and went with high expectations. The menu on the website was not what was on the restaurant. The fixed price menu should have tipped me off. It was cheap for the area. Food was cold and pre cooked. Wine selection ok. The best thing was the service. All very attentive. Almost said to a couple outside looking at the menu not to bother.